I've been on a roll reusing various junk I have found on our property. Last post I spoke about an old satellite dish that found a second life as a bird bath and lamp post. 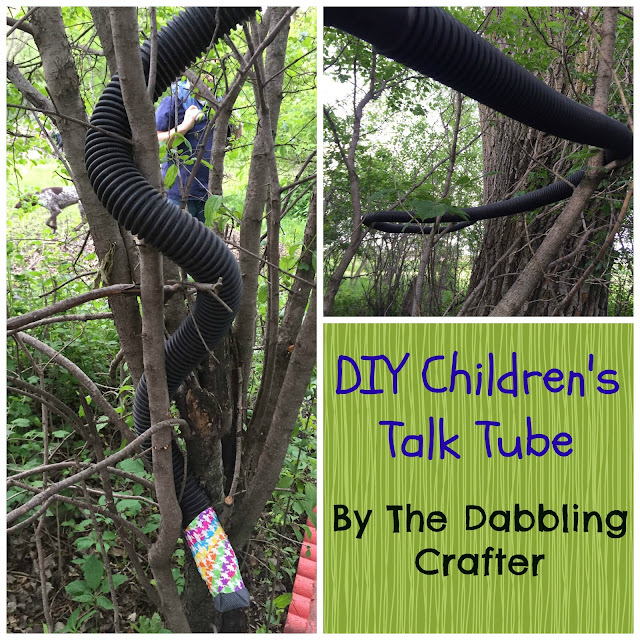 This week's post is about some extra sump pump tubing my children found in the garage. We already have quite a bit of tubing for our elaborate pump. I was just going to let the tubing sit on a hook, for, well ever, until my children took it out of the bag one day. Just as I was going to enter into "mom mode" about playing with stuff in the garage, they realized if they talked into one end, the other person could hear it. The tube entertained them for hours as my husband and I worked on the yard. I was almost tempted to give them a saw if it lead to a couple of hours of fight free play. But then I remembered Parenting 101 and child abuse statutes and decided to stick with nonlethal play things. It's optional, but I decided to cover up each end with some screen and duct tape. I wasn't sure if it would be a popular place for a bee or wasp to create a nest, but I didn't want to take any chances. Each end got a piece of screen with some fun duct tape to attach it. We put our tube through the "v" in trees. To ensure it stayed in place, I attached the tube to the trees using screws and the plumbing hanging strips. On each end, I placed the tube at just the right height for children to reach and secured with a bracket. This idea isn't restricted to trees though. You could easily attach to a playground, play house, shed or swing set. If you don't want a permanent fixture, you could hang it with string or tape it. Now we have a really fun "telephone" from one end of our secret path to the other. I can't imagine what kind of conversations will be had as our children grow!